I teach group classes on the schedule at the Weavers Guild of Greater Cincinnati. All Registration for the classes is through Eventbrite. 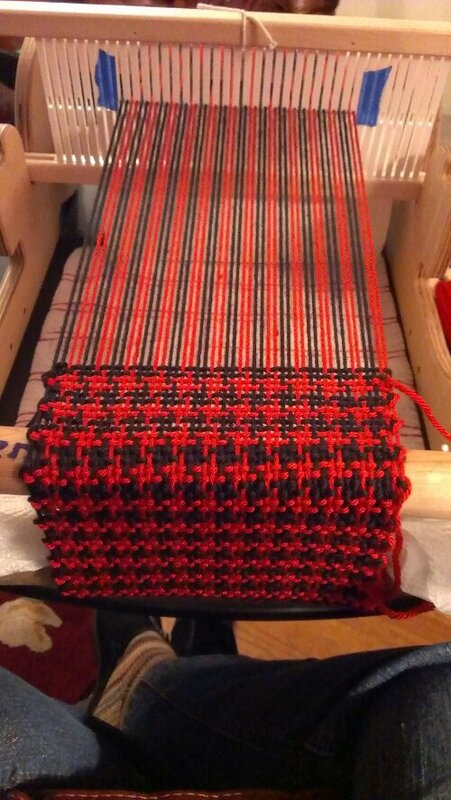 My December 8 beginning rigid heddle class is full. Winter classes beginning in January will be posted soon. Rates: A private class for an individual is $25/hour; 2 people: $20/hour per person 3 people are $15 a person. I can accommodate up to three in my studio. Groups of 4-5 will need to be scheduled at the Weavers Guild at their normal class rates (I can set up a special class there if you have at least 3) or at another appropriate location with a room and enough table space to accommodate the group. You MUST have sufficient space to schedule a group lesson at your location. If I need to travel to your location beyond 6 miles round trip, a .50 per mile fee is charged. With 4 or more, you will need an extra hour for class time as a larger group takes more time. The classes below is my current suggested curriculum for Rigid Heddle Weaving private lessons. If you want to learn something specific, we can develop a custom lesson for you. Use the contact form in the sidebar to send me an email. Schedule 2 or more projects in the series and the loom rental fee is waived. Get a group of 3-4 friends together and I’ll set up a class just for you! This will get you started weaving on a Rigid Heddle loom in about 4 hours. We use a quick method to warp and weave the scarf using an easy to find knitting yarn. The first day you learn to warp and begin weaving, take home the loom for a day or two, then we meet again to take the scarf off the loom and learn to tie the fringe. Don’t have a loom? No problem, I have looms to use in the class for a $10 fee. A private class is $25/hour. 2 people, $20/hr per person 3 people: $15 an hour per person, 4 to 5 $12 an hour. You must have sufficient space to have a group lesson at your location. If you do not, with at least 3 people we can set up a special class session at the Weavers Guild of Greater Cincinnati at their normal class rates. Beginner class helpful, but not necessary, you can start with this project. 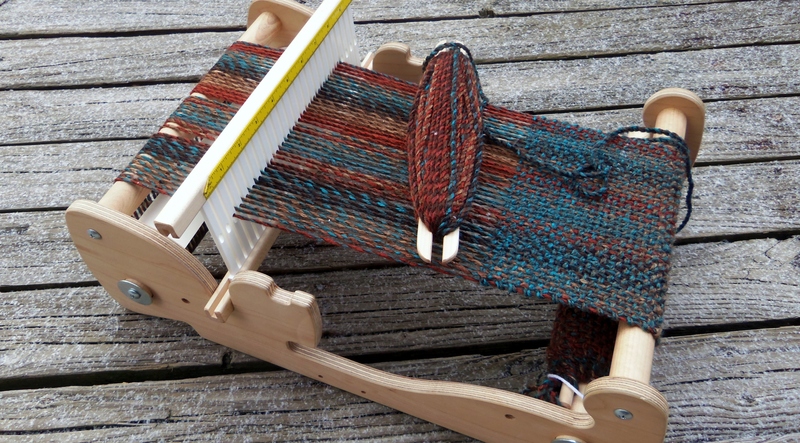 This class is ideal for a second rigid heddle project or an adventurous beginner. Weave a houndstooth check scarf in two lessons! 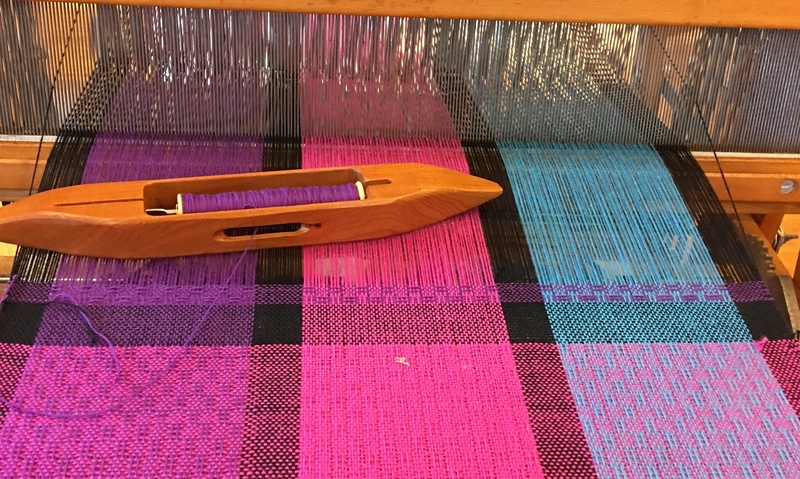 You will learn to direct warp for a color and weave scarf on a Cricket rigid heddle loom. 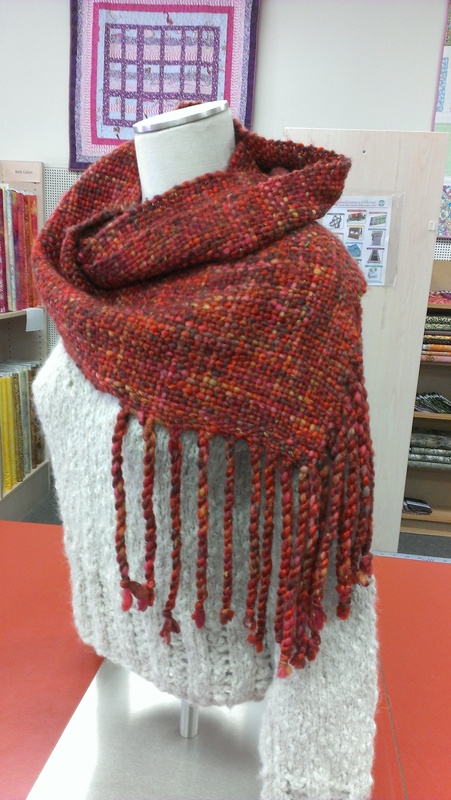 Learn to use two colors in the warping and the weaving. Take the loom home to finish weaving and we get together in a day or two to cut the scarf from the loom. The new finishing technique in this class is a a twisted fringe. Choose yarn that is a worsted weight wool or wool blend, 100 grams of each color that have a good contrast to each other. Don’t have a loom? No problem, I have looms to use in the class for a $10 fee. For Experienced Beginners- you must have direct warped and woven a previous item. Weave a Spring Scarf using some more advanced Rigid Heddle Weaving Techniques with some gorgeous spring yarns. Take your weaving to the next level with this class. Learning to weave pick-up stick patterns will open the door to a myriad of intricate, beautiful patterns. You MUST have taken the beginning rigid heddle or houndstooth, class or have similar weaving experience with a rigid heddle loom. Experienced Beginner – you must have direct warped and woven a previous item. This scarf has unique shaping and warp becomes weft! You will make a circular scarf that has a V-shape edge where you connect the two ends by weaving the warp from the beginning into the end as weft. Must have previous experience weaving on a rigid heddle loom. You will learn my special techniques to make this easy to do. You will need to be able to warp and weave on your loom prior to class according to the instructions sent to you. See http://www.weaversguildcincinnati.org/classes.php for details and registration information. I volunteer at Heritage Village Museum and Education Center. I am interested in learning the basics of weaving on floor looms. Is this something you can teach me as an individual? I know the Weavers’ Guild is having two day classes on a floor loom, but I prefer private lessons. Can’t make days they have scheduled. Where is your studio? I do not have a loom. Sorry it took so long to reply to the comment. I had not been getting notifications that I had some. Glad you called to set things up with me. Looking forward to seeing you next week.